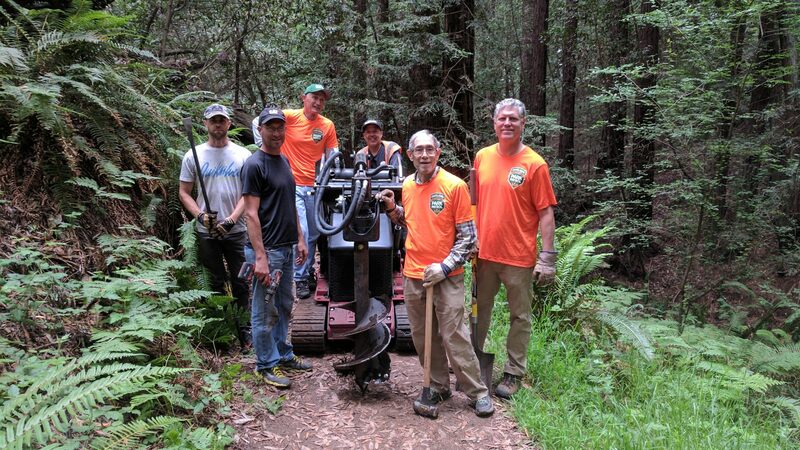 Oakland Trails volunteers are dedicated to keeping our trails open and safe. 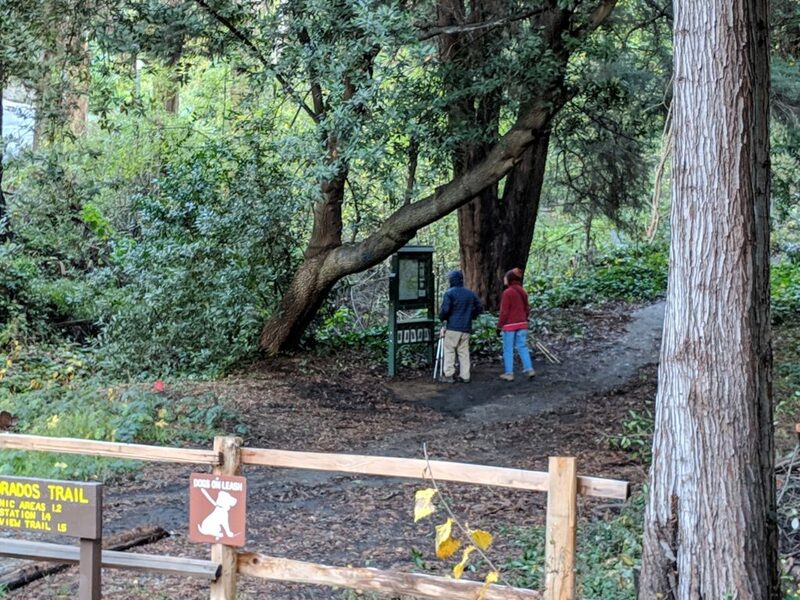 This new trailhead kiosk was donated by Oakland Trails, and includes a “You Are Here” map, information about redwoods, emergency contact information, and a map holder. Special thanks to Save the Redwoods League for their contribution to the message board content. Park Patrol compiles data from our daily reports at six-month intervals (or by request from City staff). To view our latest report, please click HERE. 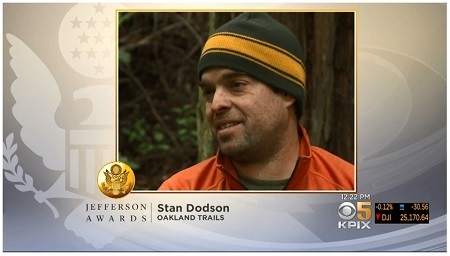 For the story produced by CBS SF Bay Area, KPIX 5, click here. 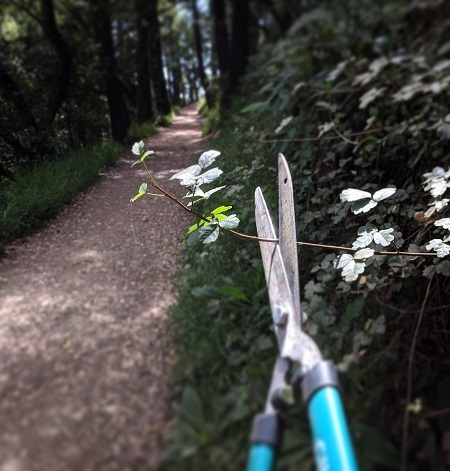 Every year since 2010, once the rainy season is behind us, Oakland Trails volunteers grab some tools and hit the trails in Dimond Canyon and Joaquin Miller Park to cut back overgrowth, including blackberry, impeding tree branches, brush, and yes, poison oak. 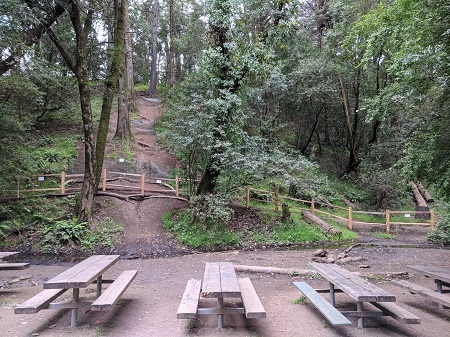 Bootleg (unauthorized) trails are a growing problem in Joaquin Miller Park, and all trail users are to blame. 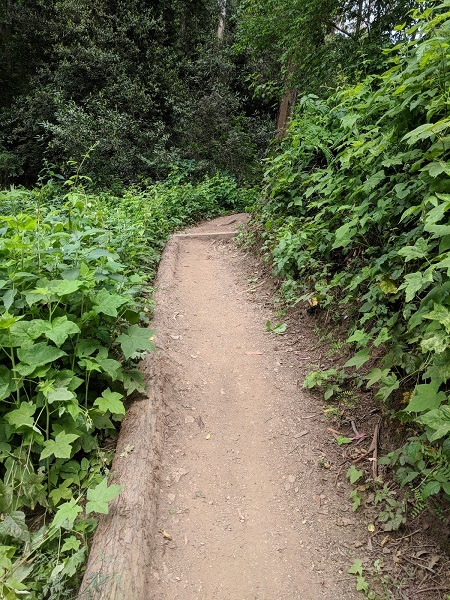 On this particular hillside near the meadow, we witnessed mountain bikers riding/sliding down through the area, while hikers and runners would use it as an uphill shortcut to Sanborn Dr. 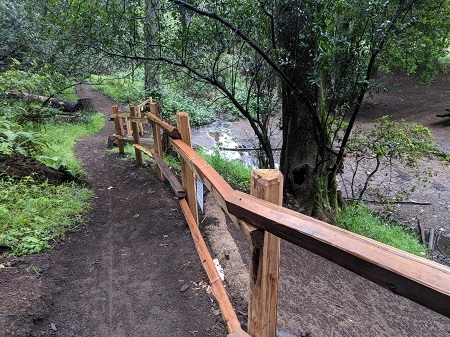 Erosion was burying the Sinawik Trail, trail users were exposed to safety hazards, and Palo Seco Creek below was experiencing negative environmental impacts. 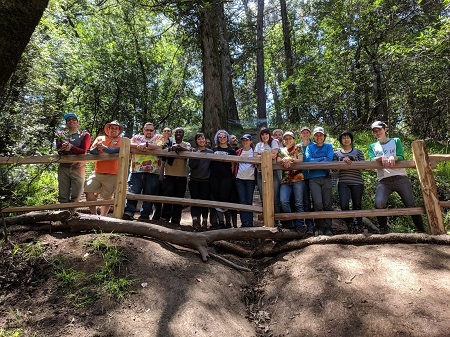 Meeting with Oakland Public Works staff, Oakland Trails volunteers, along with members of the Bicycle Trails Council of the East Bay, came to a consensus for a plan to block the top of the scarred hillside with temporary fencing and signage, while installing a split-rail cedar fence below to protect the creek. 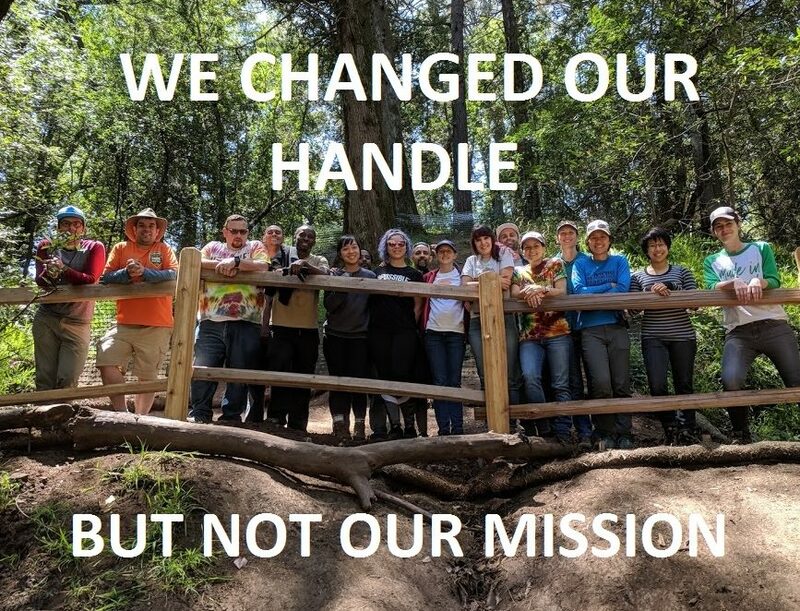 Leading a group of 18 volunteers from Impossible Foods, we got to work installing the fencing and signage. 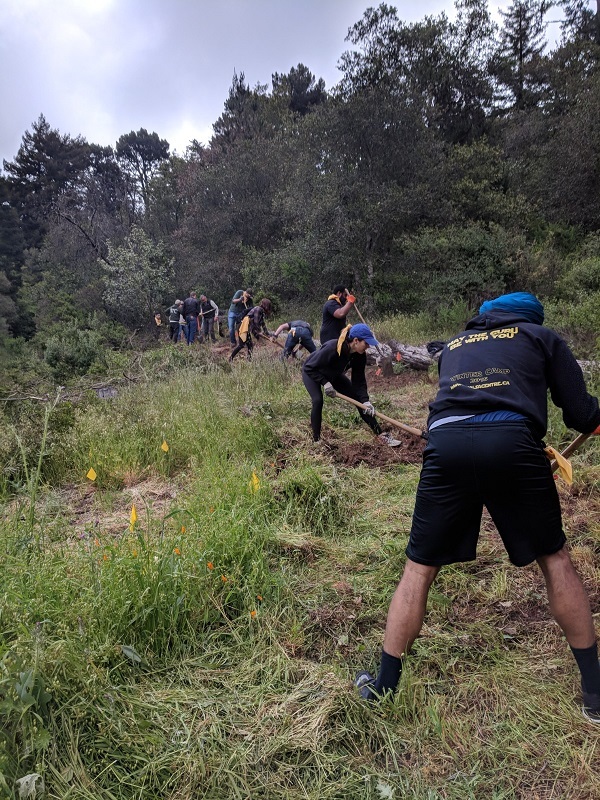 Please respect this work led by local mountain bikers and hikers working together to mitigate negative impacts caused by inappropriate park use. 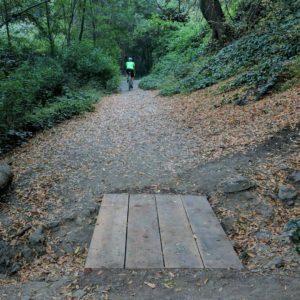 Trail users will be safer, and the creek and watershed will be healthier. 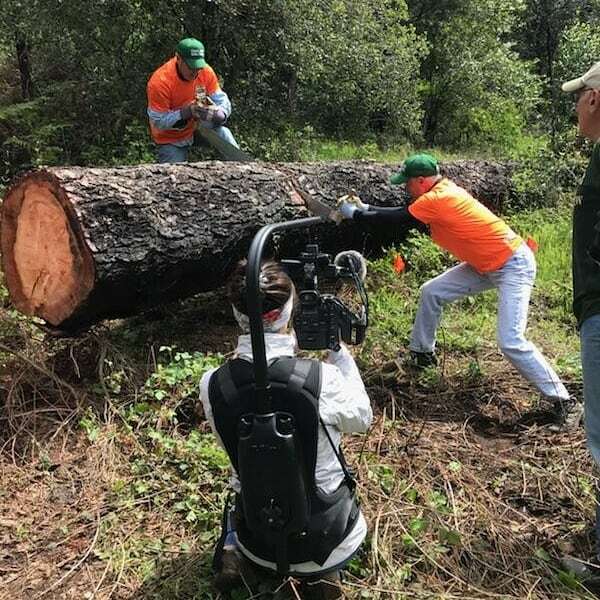 Special thanks to Oakland Public Works Environmental Services, the Bicycle Trails Council, Ashby Lumber, and volunteers from Impossible Foods. 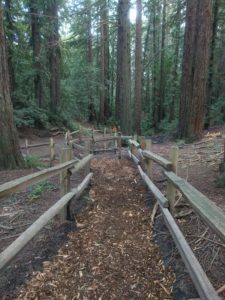 Back in February, we came to the conclusion that the Camp Trail had become too rutted to be enjoyed by any type of park user. 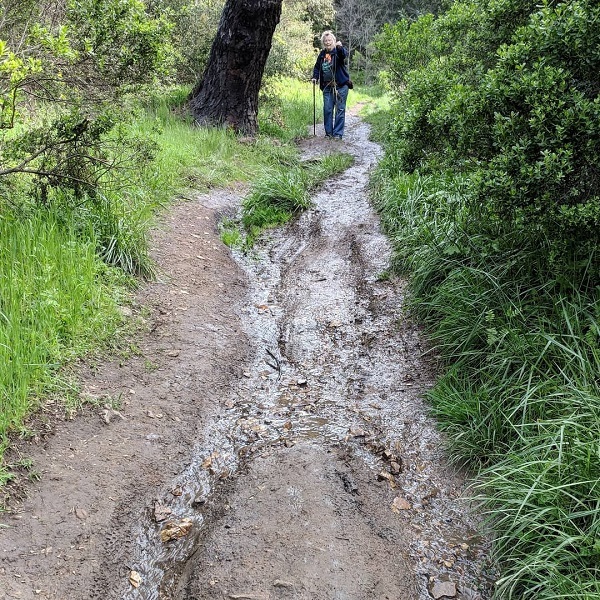 Like most trail damage, water was the culprit, but it wasn’t the seasonal creek’s fault that the trail and it were sharing the same alignment! 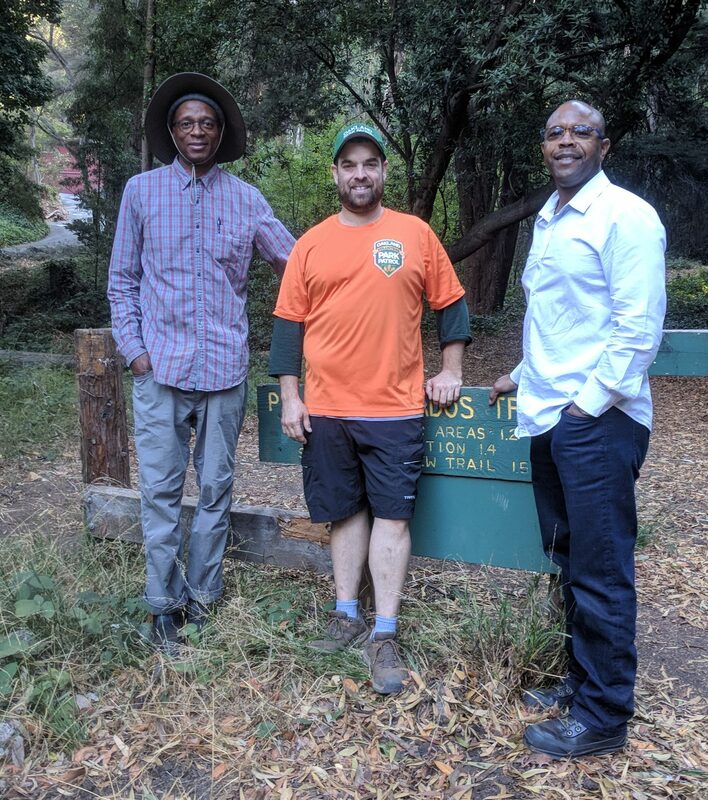 We invited Oakland Public Works, Friends of Sausal Creek, and the Bicycle Trails Council for a site visit to determine the best plan of action. 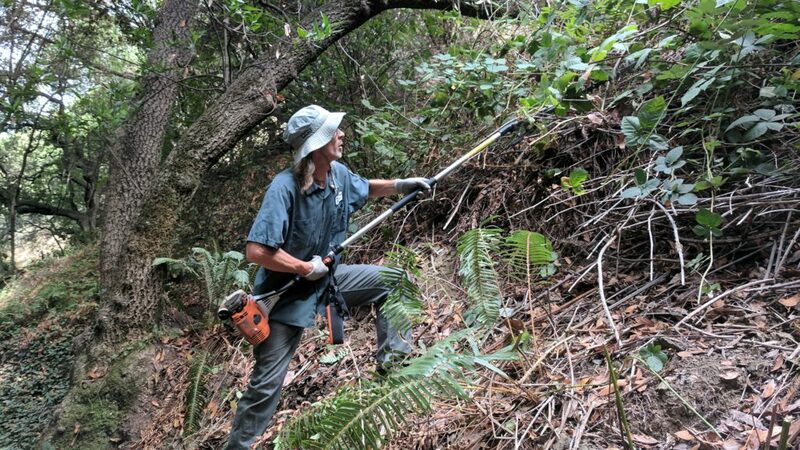 We all agreed that the trail needed to be moved, so we did a native plant survey, transferred some bracken ferns, cleared a fallen tree, then flagged the new route away from the seasonal creek. (On our first real work day, the filmmakers for our upcoming documentary, “Old Survivor”, came out to film our collaboration). 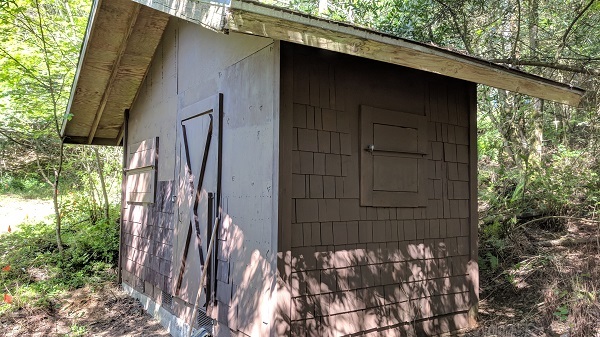 After two weeks of preparations, including flagging the new trail, clearing brush, and putting some fresh paint on a PAL Camp storage shed that was near the new route, we were ready for a big work day. 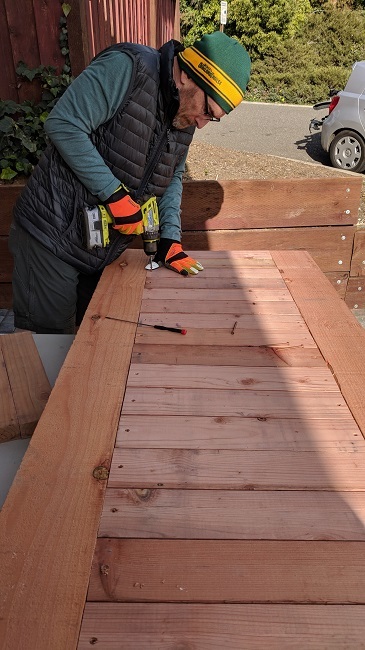 Park Patrol volunteer Sara K. is also an employee of Airbnb, and with their Week for Good community service event coming up, she engaged me to lead a project for her group. 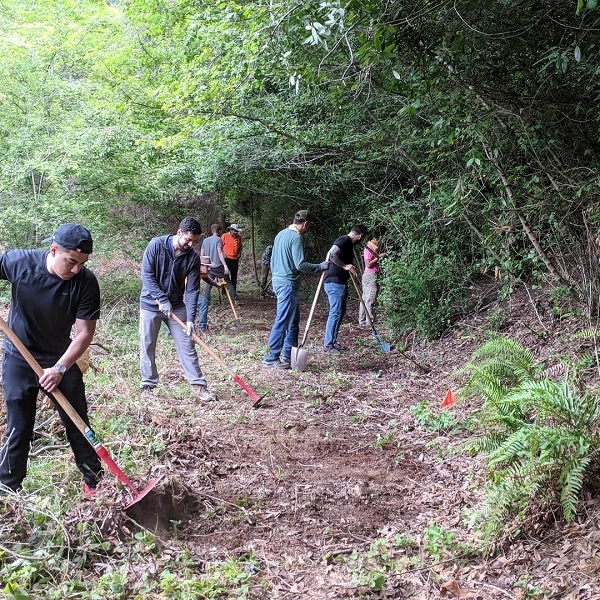 We decided to use their help – with more than 20 volunteers – to build the new trail. Along with leadership from the Bicycle Trails Council, we met on a foggy Wednesday morning and got to work. 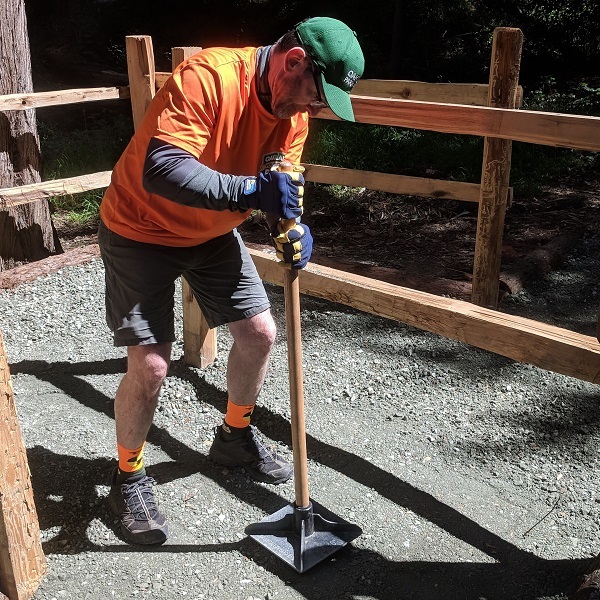 With more than 30 volunteers involved, from Oakland Trails, the Bicycle Trails Council, and Airbnb, we had not only built the new trail, but also blocked off the old one so it could return back to nature. 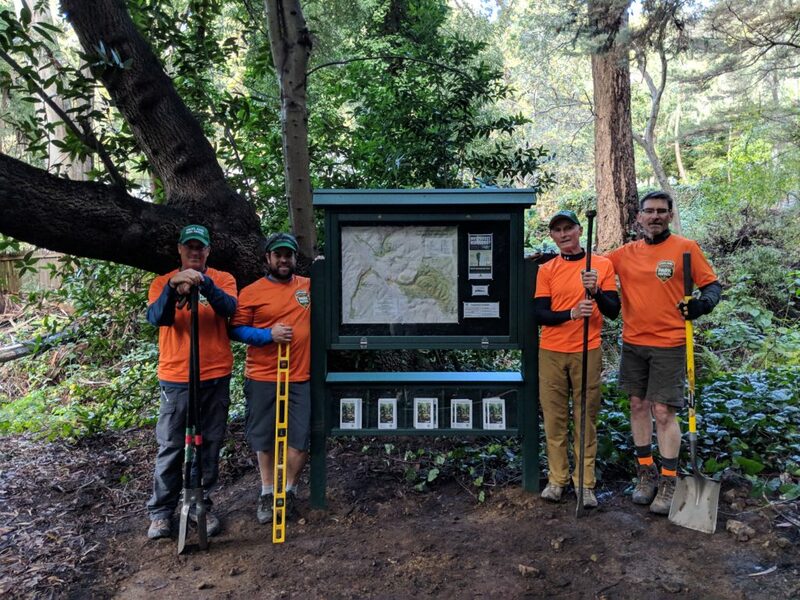 A big thank you to our partners on this project: Oakland Public Works, the Bicycle Trails Council, our Park Patrol volunteers, and Airbnb. Last winter, a large bay tree slid down the hillside and landed smack dab in the middle of the Dimond Canyon Trail. 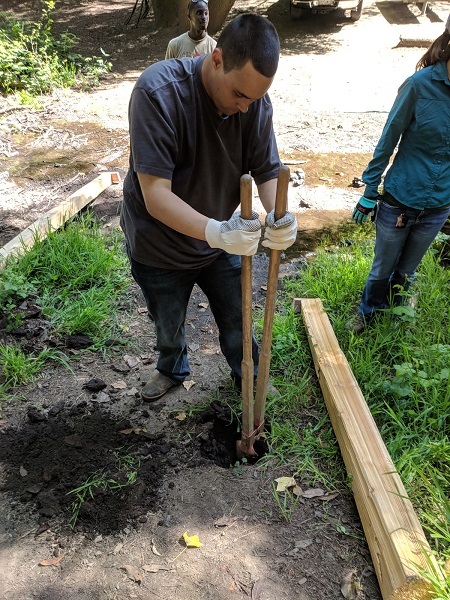 We were able to move the trail around the still-living tree, but a lot of impermeable soil, aka muck, now plagued the area. 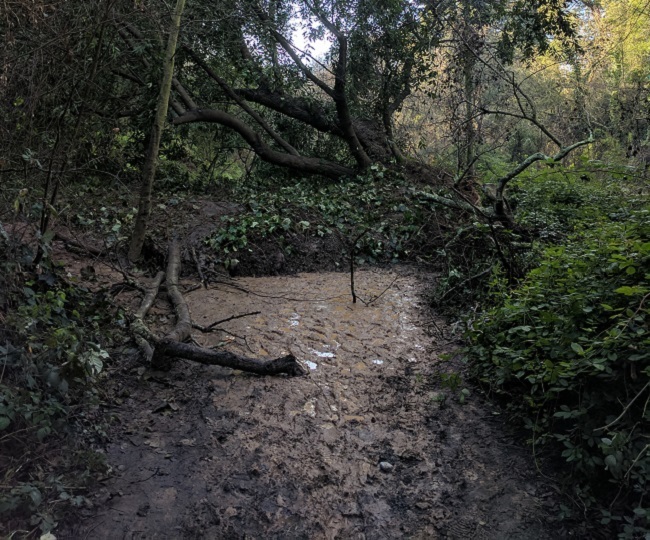 With any rain at all, about 30 feet of trail turned into a mud pit. 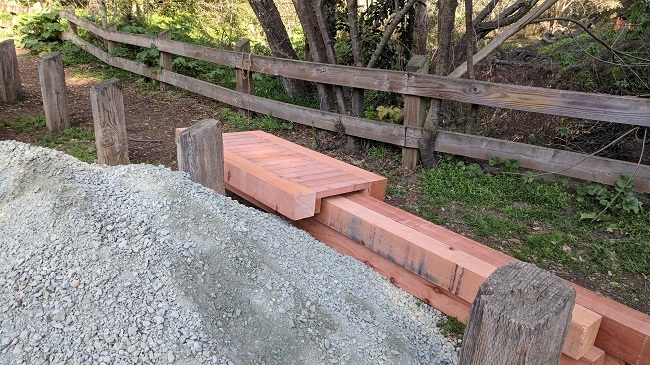 You can see above that a trail user laid out some plywood to help navigate through the affected area, but in early February we engaged Oakland Public Works staff to plan a more permanent fix. 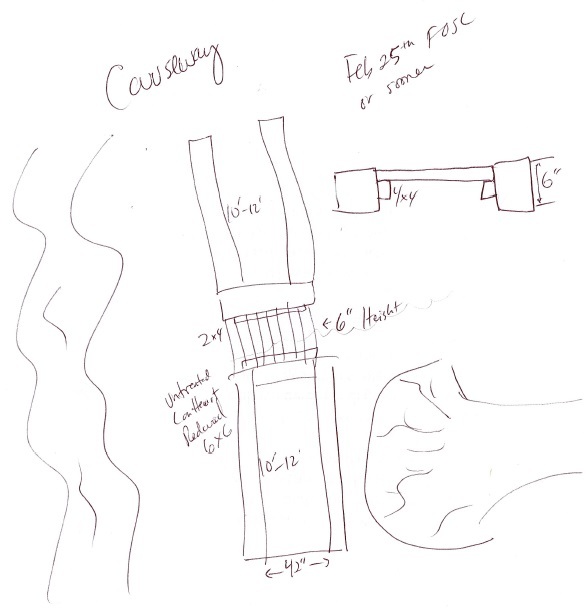 The plan was simple: build about 30 feet of causeway, or raised trail, to improve the route. 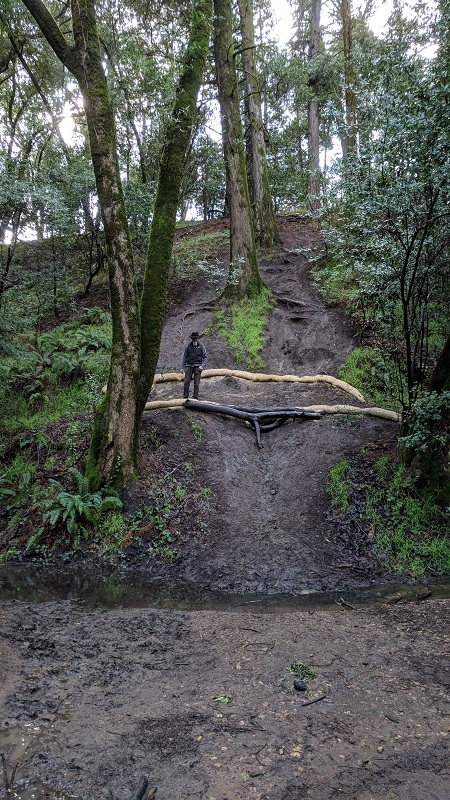 A bridge was included in the design to allow any rain runoff to make its way to nearby Sausal Creek. 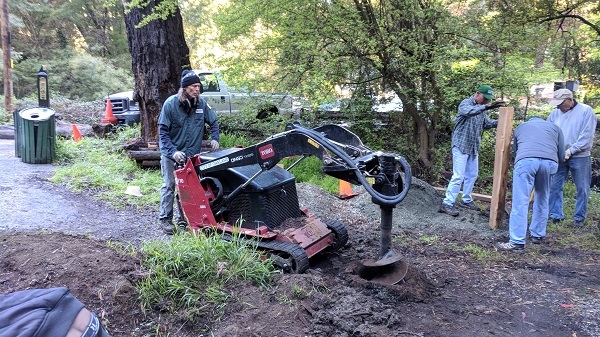 With approval in place from a Public Works Supervisor, we teamed up with Friends of Sausal Creek (FOSC) to finalize the logistics and pick a work day. 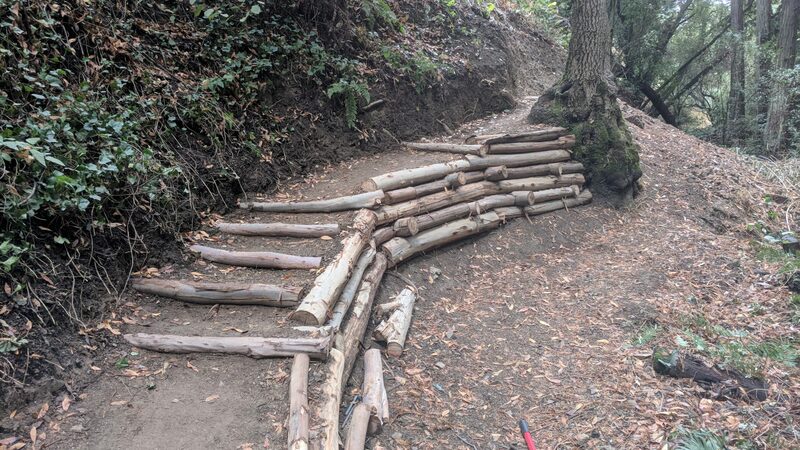 Oakland Trails would fund this project, procuring and prepping all the needed materials, then meet up with FOSC’s monthly trail crew to install it. 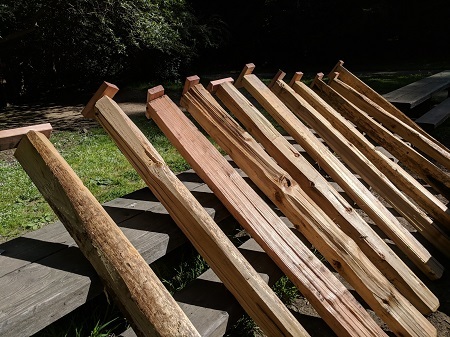 We picked up the materials, about $900 worth of redwood, deck screws, and rebar, then staged the project at my home in Oakland. There, my brother and I drilled out the holes for the rebar and pre-built the bridge. 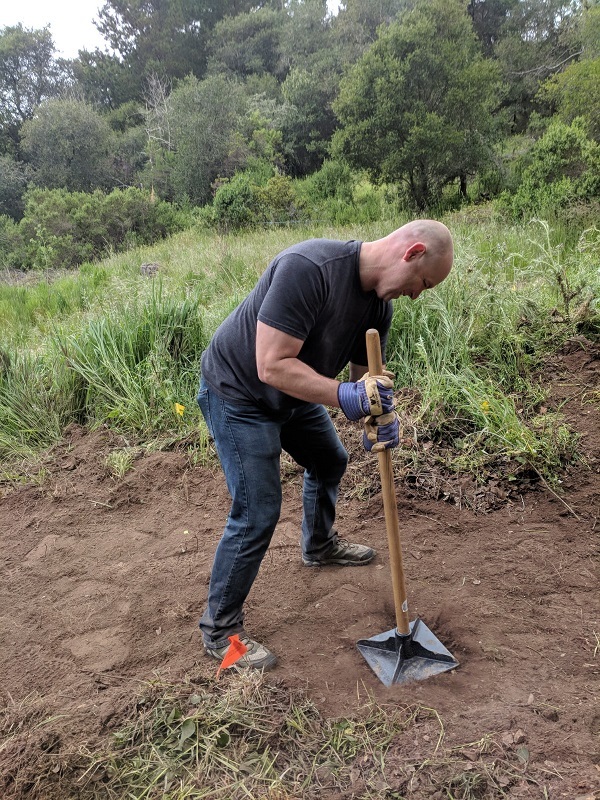 On the morning of the workday, we delivered the materials to the Dimond Canyon Trailhead, staging it all near the four yards of gravel provided by the City of Oakland. 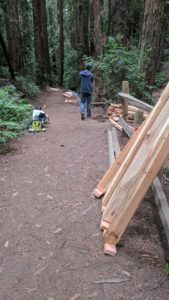 Having met up with the FOSC trail crew, we hand-carried the timbers and the pre-built bridge to the site, then began framing out the causeway. 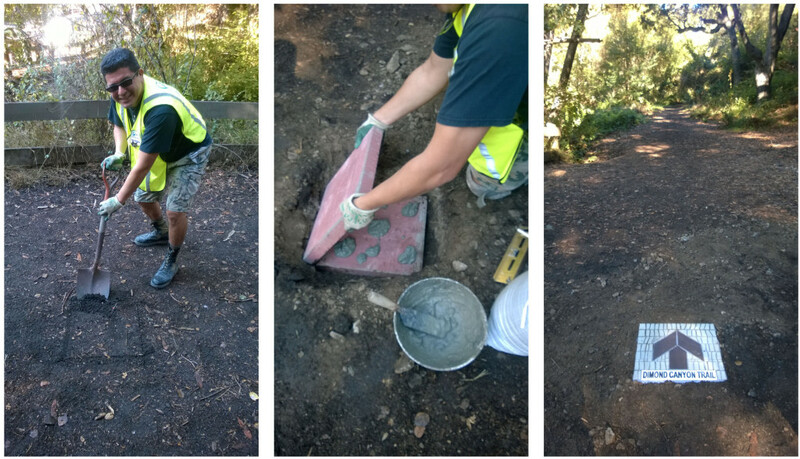 Once the frame was secure, we started filling it with gravel, tamping in the crusher as we went along. 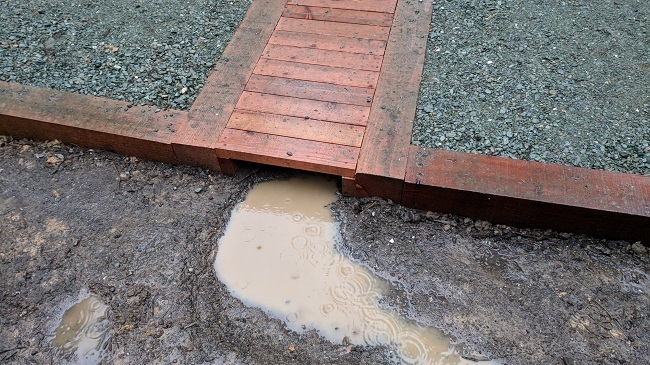 After completing the project, we were lucky to get some good rain to test the drainage. We were pleased to see it working as planned. 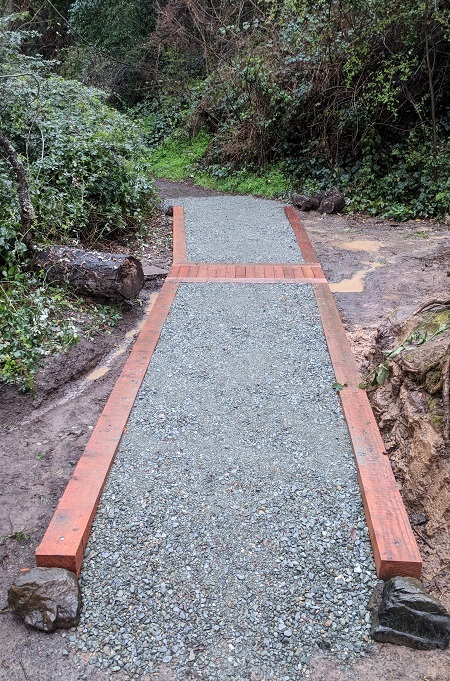 Special thanks to Friends of Sausal Creek, Ashby Lumber, La Farine Bakery, and Oakland Public Works for partnering with us on this project. Please donate to our stewardship programs. 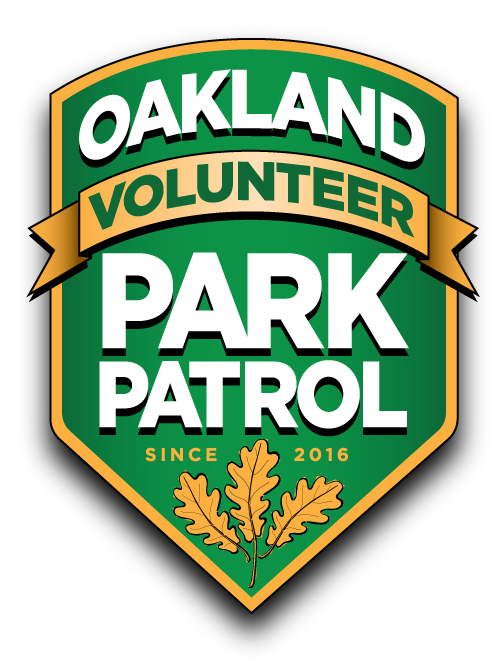 On Thursday, November 2nd, Oakland Public Works hosted their annual Volunteer Appreciation Dinner, where leaders of all the Adopt-a-Spots in the City of Oakland are invited to gather for a celebration. 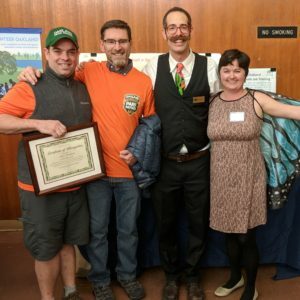 A few programs are usually singled out and given an award, and this year, on behalf of Oakland Trails and more than fifty Park Patrol volunteers, I was honored with the Parkland Steward Award. 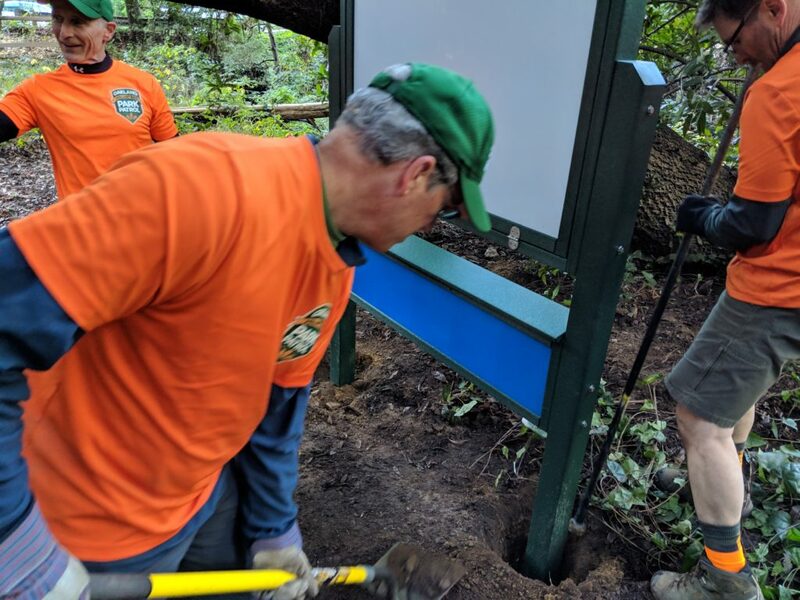 Our more than 60 volunteers should all be proud of this and the work we’re doing in the parks. 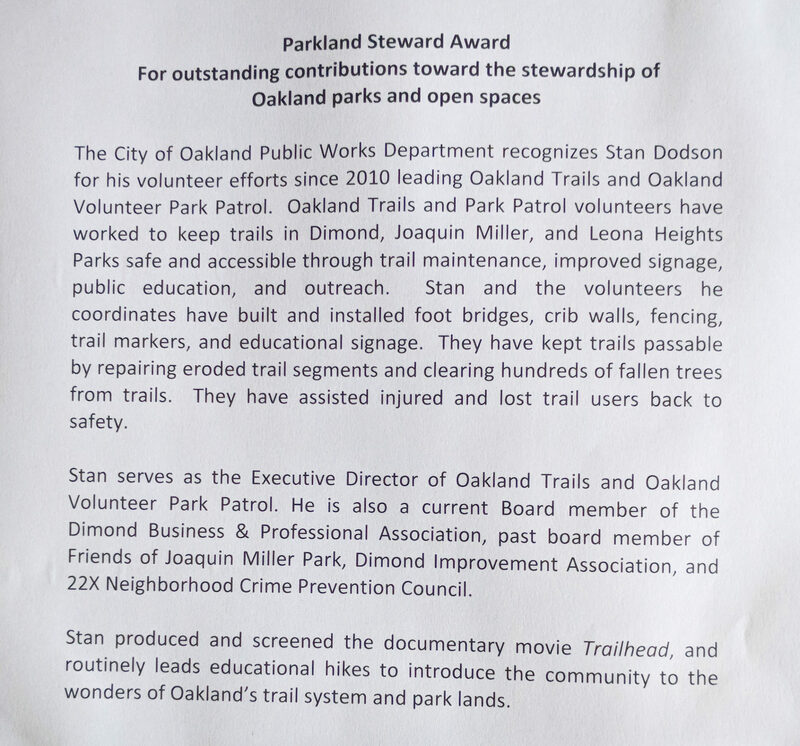 We’re making a very positive impact and the City of Oakland recognizes and appreciates it. 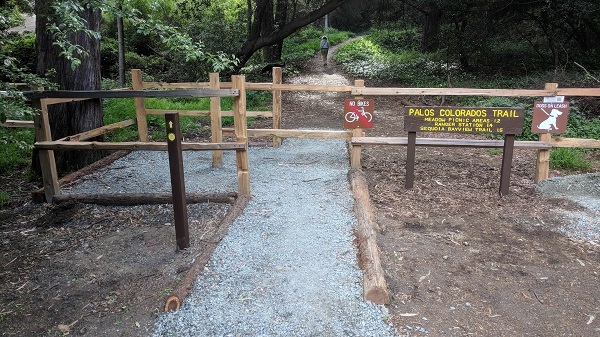 Like most trails in the region, the Palos Colorados Trail in Joaquin Miller Park took a beating last winter. The above-average precipitation was much needed, but water is a trail’s most destructive force. 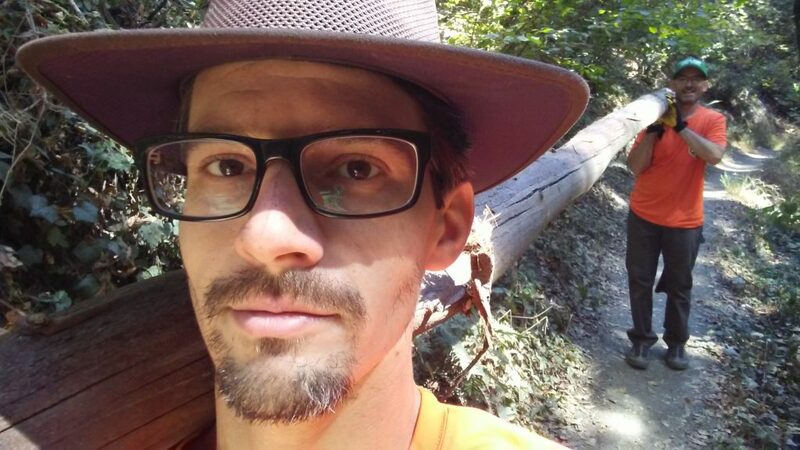 The heavy rains caused many trees to fall, and landslides took out whole sections of trail. 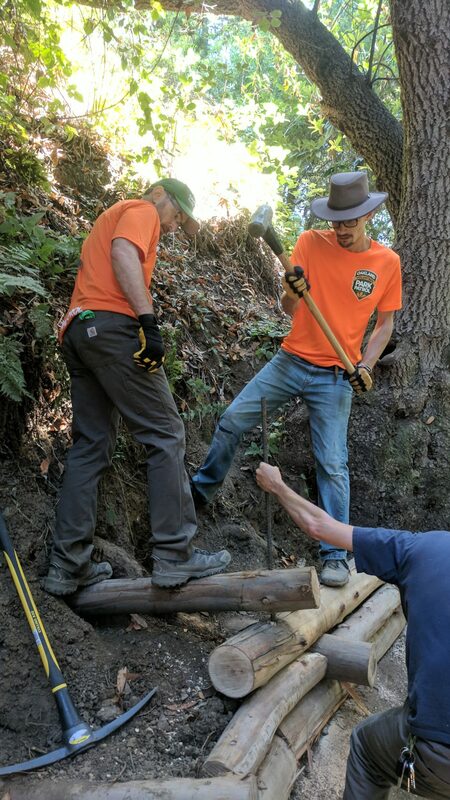 To respond, Oakland Trails volunteers cleared several fallen trees, shored up four slides, and moved the creek crossing upstream to help ensure hiker safety. We saved this biggest project for last. 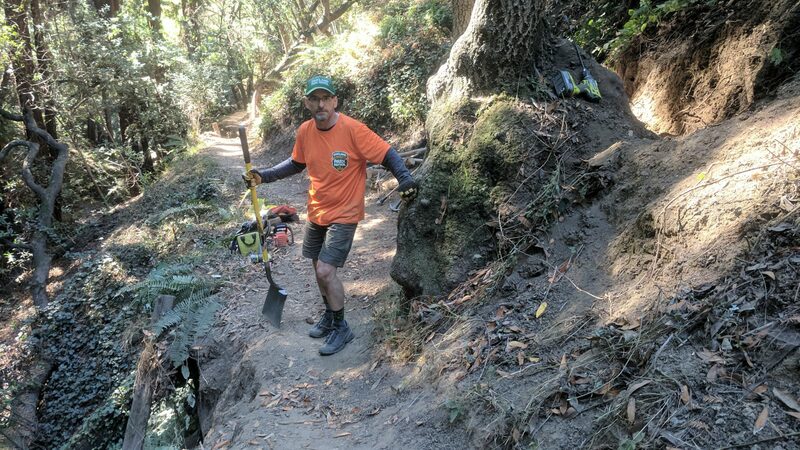 As you can see in the picture above, the trail below the bay tree was failing. 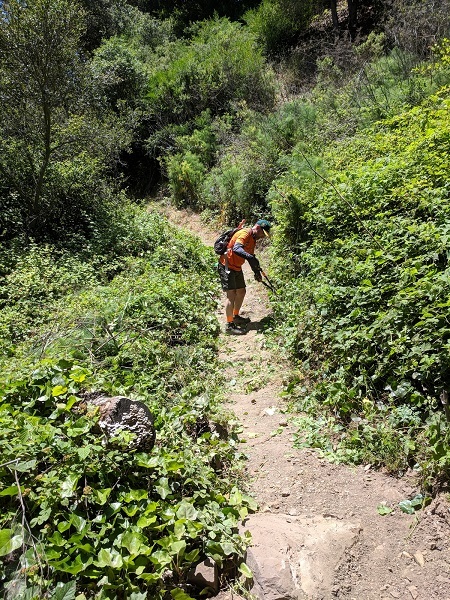 With a steep drop off below, this very narrow section of trail was sliding into the creek and had become unsafe. 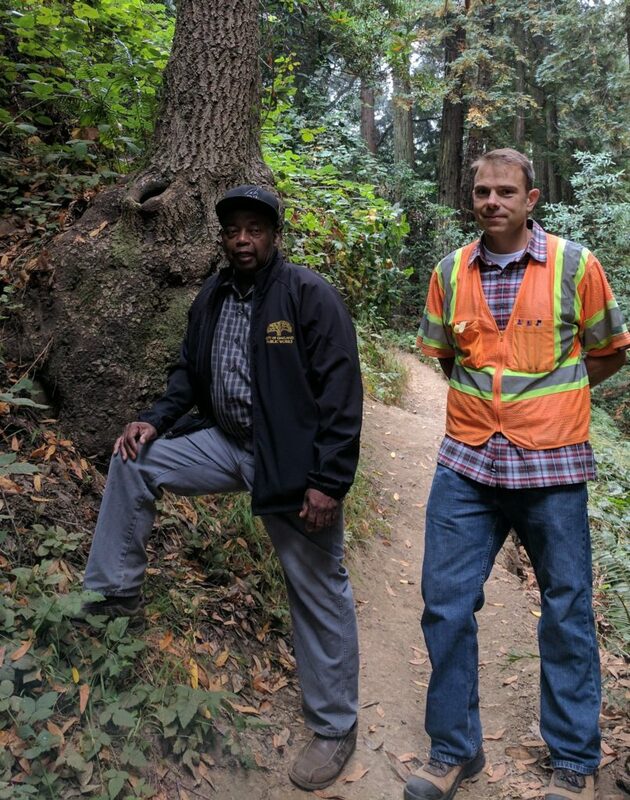 To begin planning the repair, I met on site in August with Oakland Public Works staff, including a maintenance supervisor and arborist, and trails expert Dee Rosario. 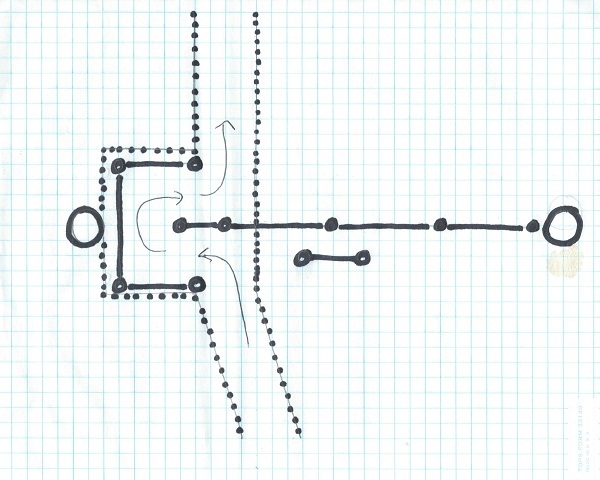 Together, we assessed the failing trail and devised an appropriate plan to fix the problem. 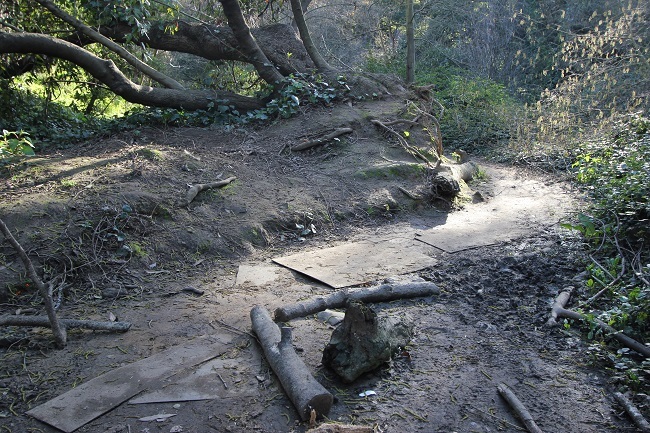 With confirmation that the large bay tree was healthy and could not be removed, we agreed the trail would have to be moved to above the tree. 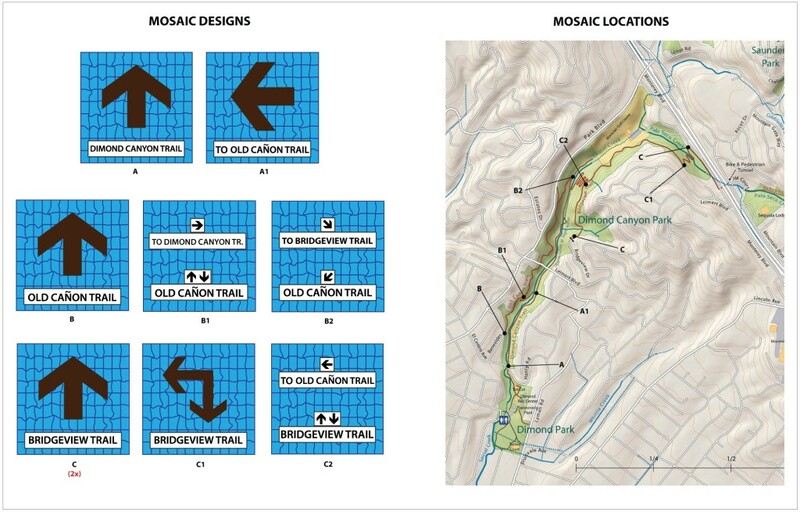 This would require about 80 feet of new trail. 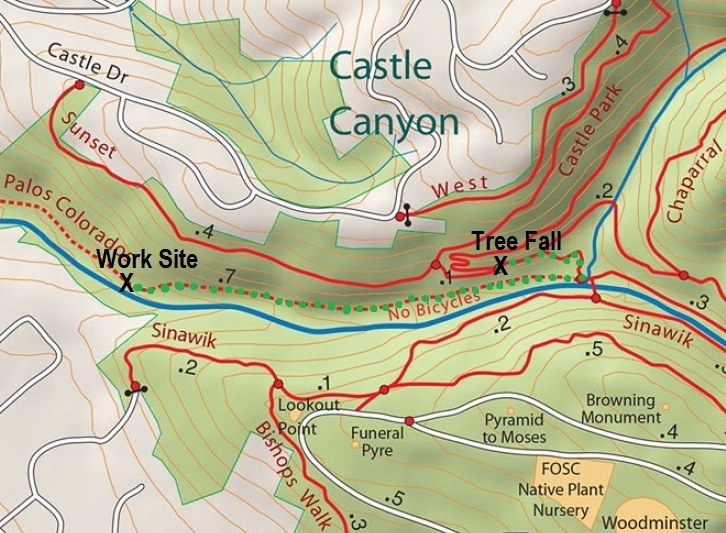 To accommodate the reroute, a crib wall would have to be built below the tree, and a full bench would need to be cut into the hillside above the tree. 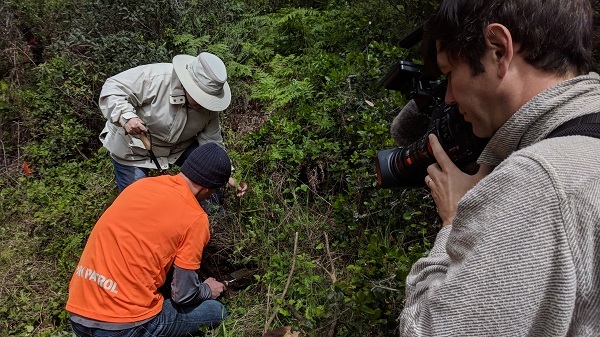 To prepare for this project, I escorted Public Works staff to the site – about 1/2 mile up the narrow trail – so they could help us by clearing out thorny blackberries and poison oak with power tools (the ferns in the picture were spared and transplanted nearby). 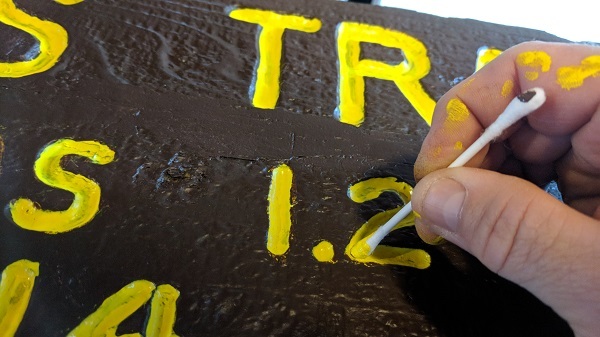 Next, over several volunteer work sessions, we would begin working on the crib wall. 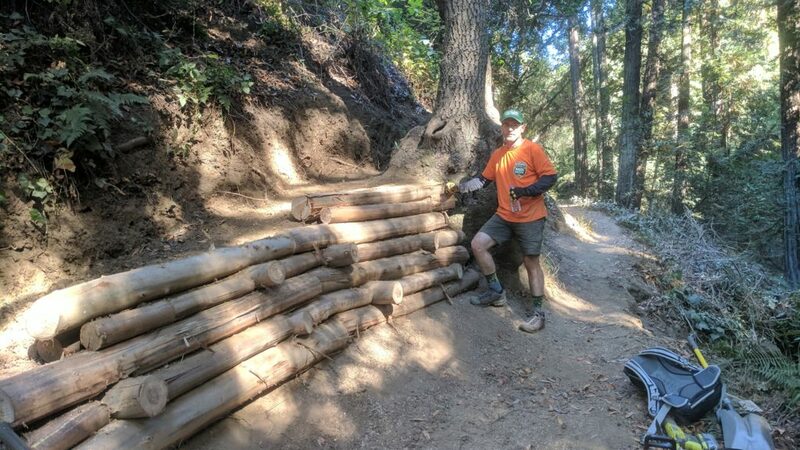 Back in March, several eucalyptus trees fell across the bottom of Cinderella Trail. 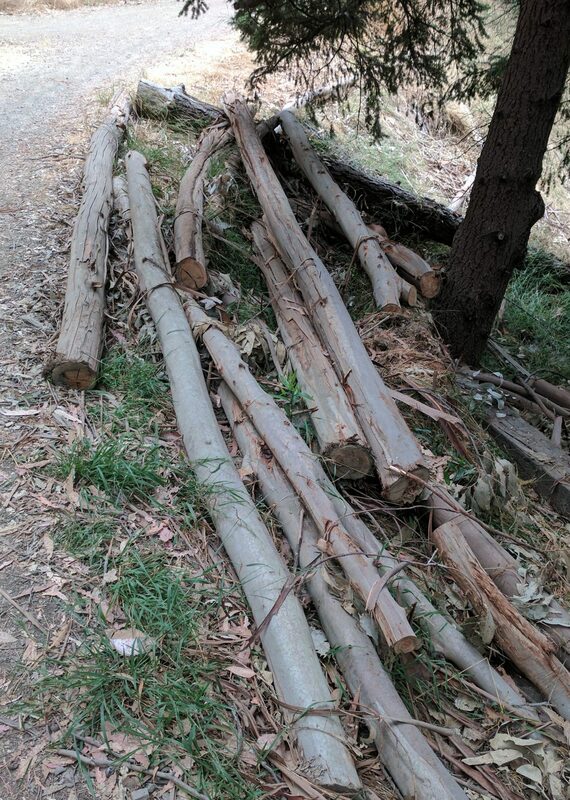 Because eucalyptus is naturally rot-resistant, we stashed the cleared tree trunks alongside Sunset Trail for any future needs. It was from here that we’d gather free material to build our crib wall. Green eucalyptus is dense and heavy. 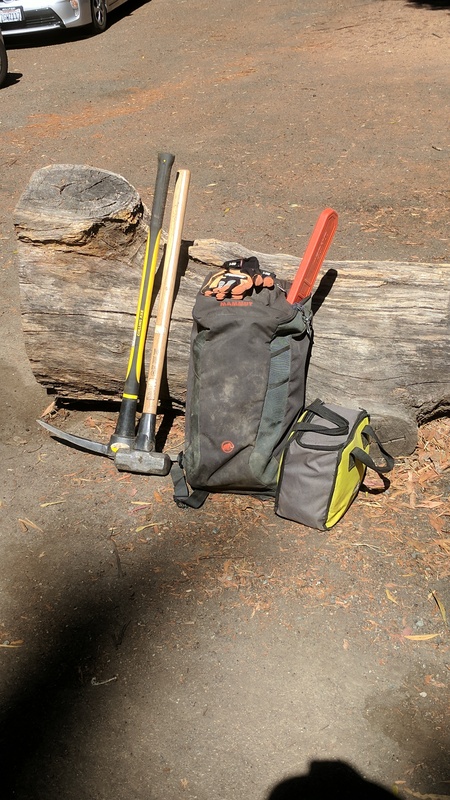 We cut the logs to lengths we could handle, then carried them one by one almost 3/4 mile to the work site. 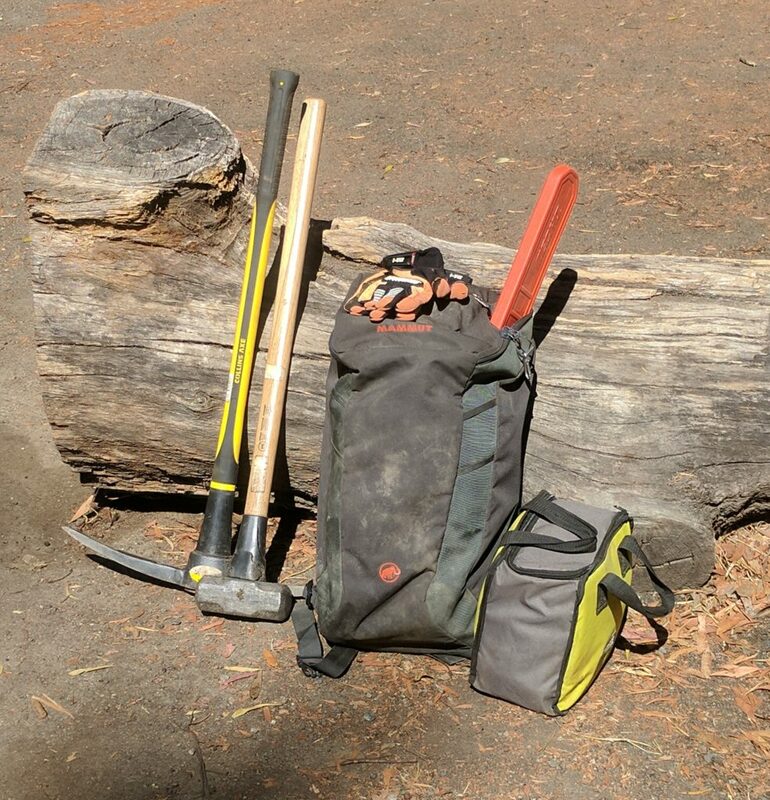 We also had to hand carry the necessary tools and other materials to the site, including digging tools, 5/8″ rebar, and sledgehammers. Work on the crib wall began. 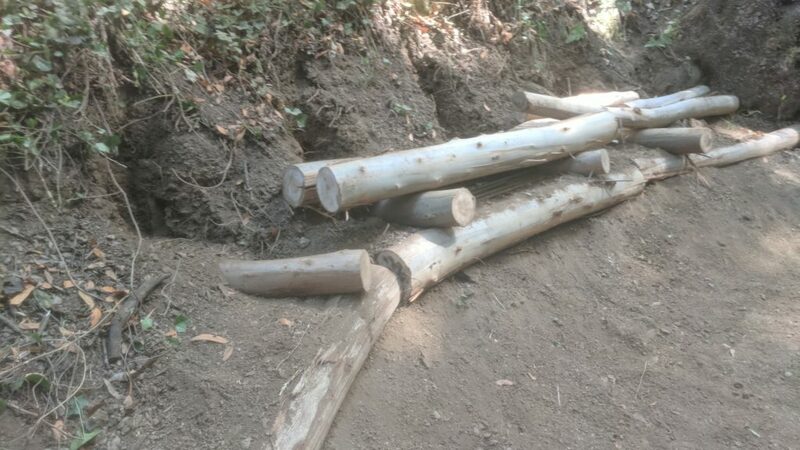 The cross pieces in the first layer were secured nearly two feet into the hillside for stability. The crib wall was constructed with 3 foot pieces of 5/8″ rebar. 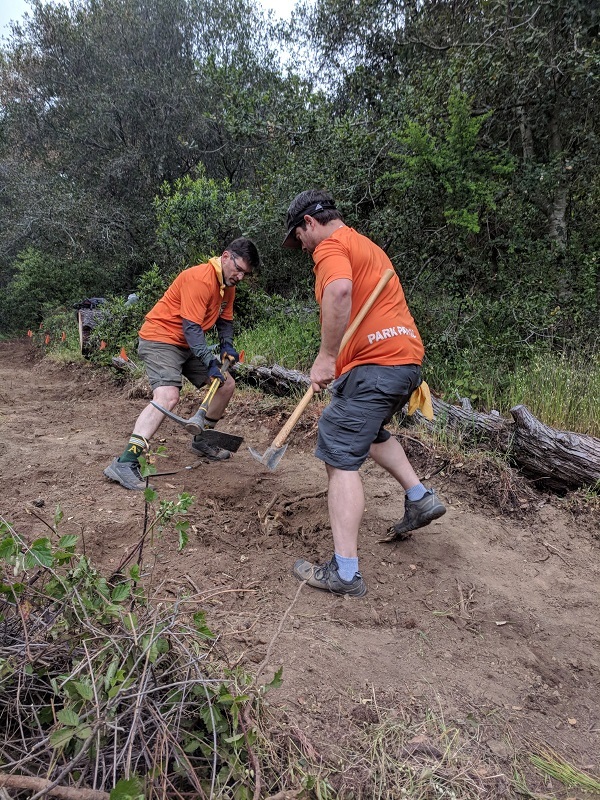 Over ten work sessions with crews of 2–4 volunteers, we continued to supply the work site with materials so we could finish layering the crib wall. 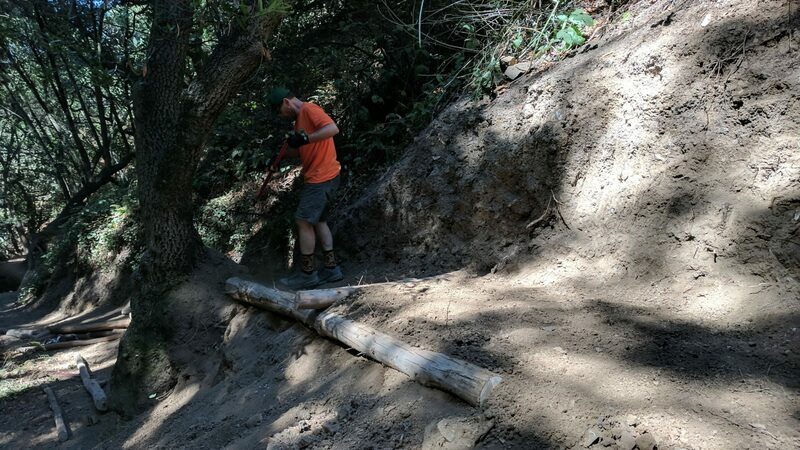 With the crib wall almost complete, it was time to cut out the trail above the tree so we could close the old trail and open the reroute. On a Sunday in late September, we enjoyed the help of the Friends of Sausal Creek trail crew. 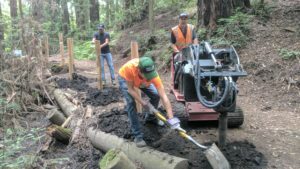 By the end of their work session, the new trail had been formed. 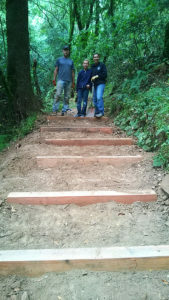 Over the next few days, Oakland Trails volunteers would come back to put in the finishing touches. 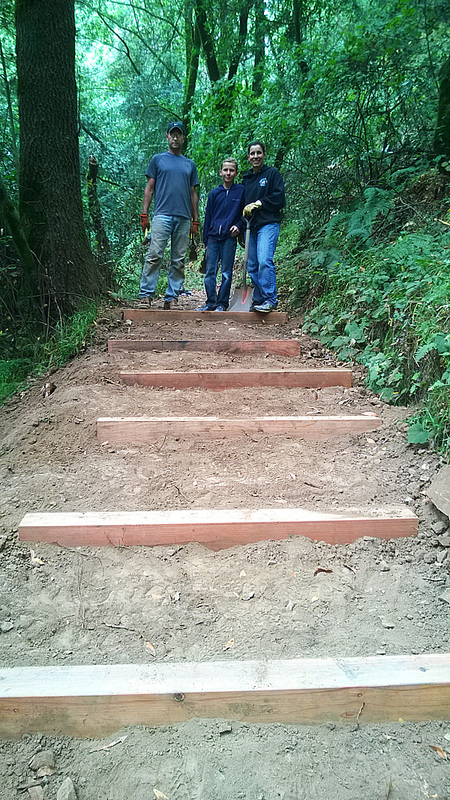 We added some timber supports to the uphill side of the trail, and installed a few steps. With our work almost finished, we reached out to Public Works staff for an inspection. It passed with flying colors! 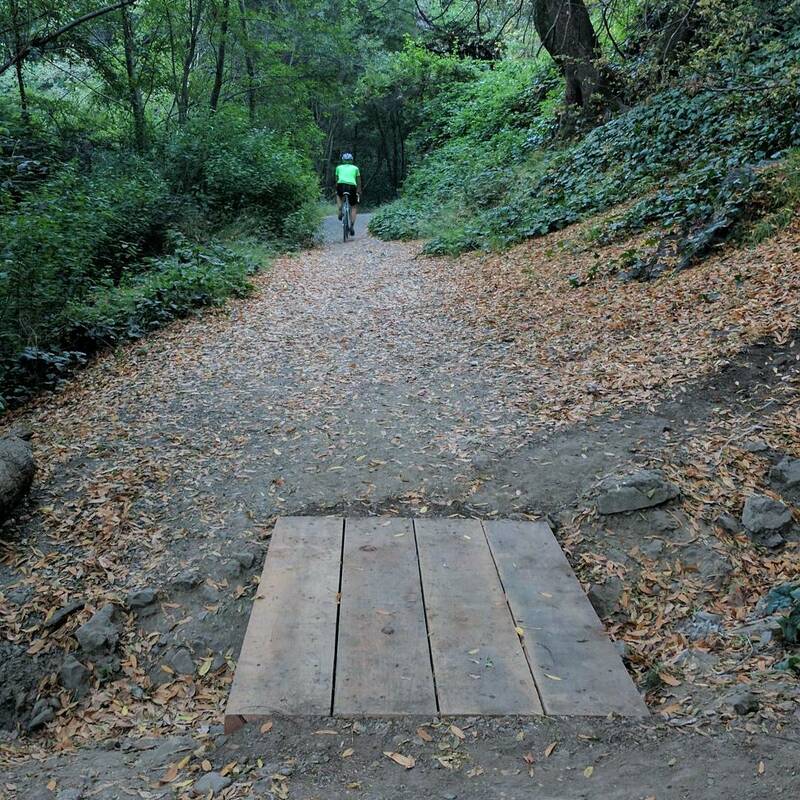 This trail should be safe and accessible for another 20 years. 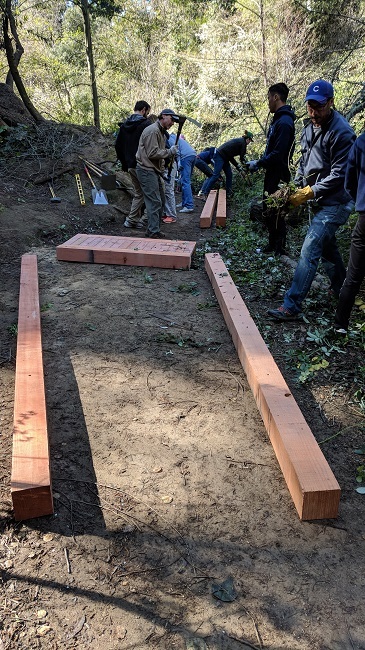 We’d like to Oakland Public Works, Friends of Sausal Creek, Friends of Joaquin Miller Park, Rob Werner & Siew Chan Werner, Ashby Lumber, and the Optimist Club of San Leandro for their support with this project. 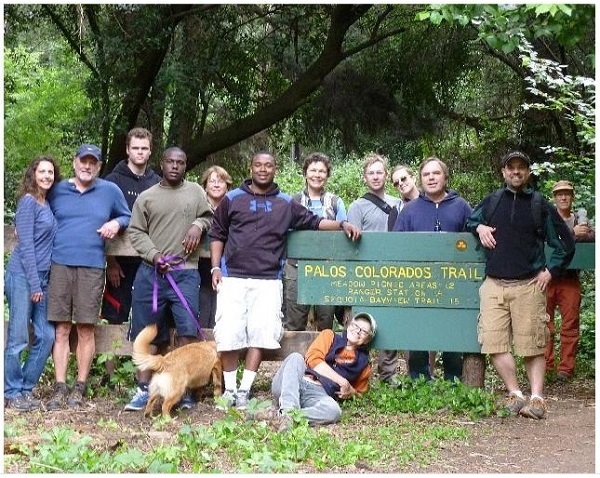 Also thanks to Park Patrol volunteers Gary, Evan, Chris, Paul, Nelson, John, and Luke for your many hours of hard work! 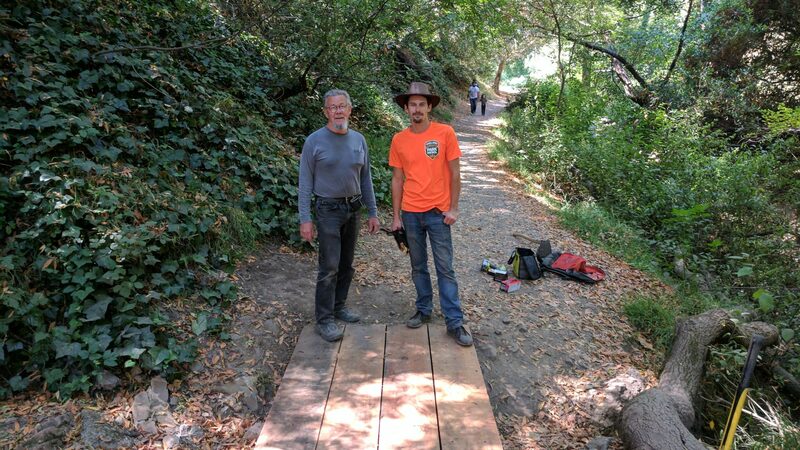 We recently constructed a footbridge on the Dimond Canyon Trail. 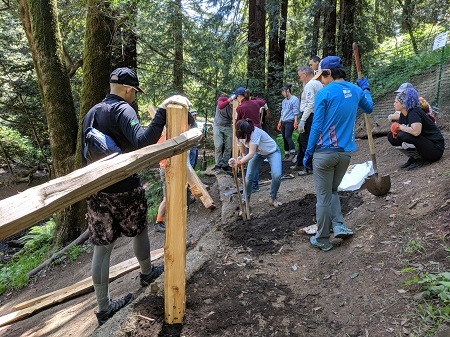 This project spanned an open culvert on an otherwise accessible trail, improving the creekside path for hikers, mountain bikers, those with strollers, and anyone with mobility challenges. 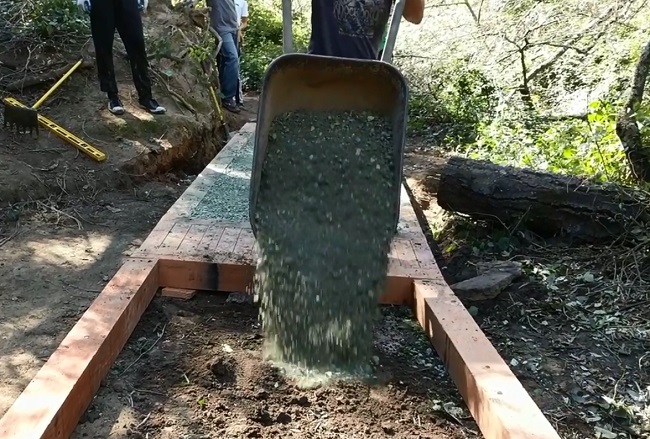 This project was approved by the City of Oakland, and funded by Oakland Trails. To donate to our ongoing stewardship projects, please click HERE. 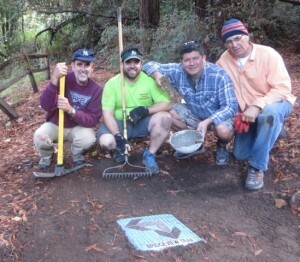 My team: thanks much to Henry from the Bicycle Trails Council, Luke from Park Patrol, and Ashby Lumber. 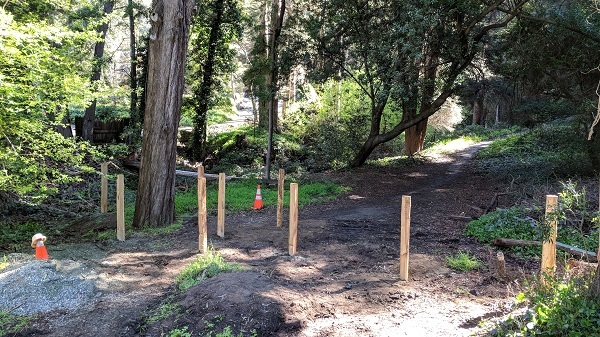 A few years ago, in an effort to protect the redwood grove at the top of Fern Ravine Trail in Joaquin Miller Park, Friends of Sausal Creek (FOSC) teamed up with Volunteers for Outdoor California (V-O-Cal), Oakland Parks & Recreation (OPR), and Oakland Public Works (OPW) to construct a rustic, split-rail cedar fence. 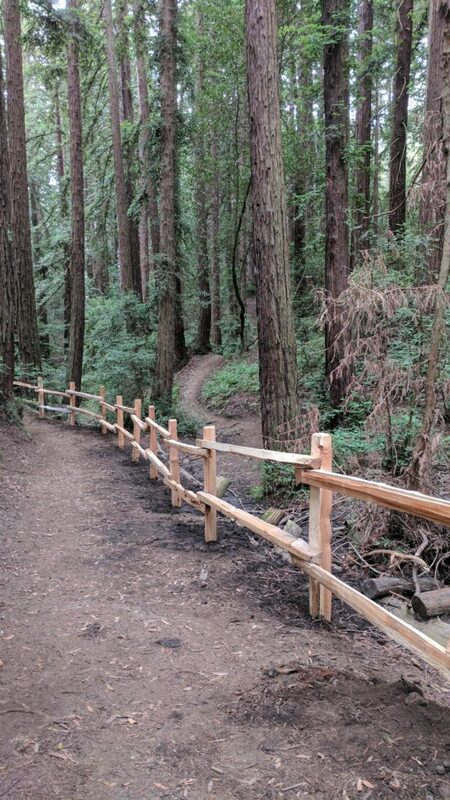 Since the construction, the redwood understory protected by the fence has thrived. 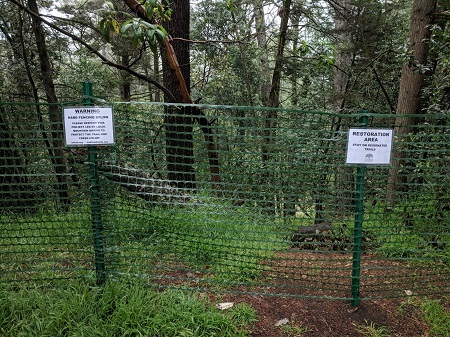 This week, in an effort to finish the project that was only partially funded, Oakland Trails embarked on a mission to extend the fence as originally approved. Jan–Feb, 2017: Meeting on site with all the stakeholders, the project to extend the fence was approved by FOSC, OPR and OPW. 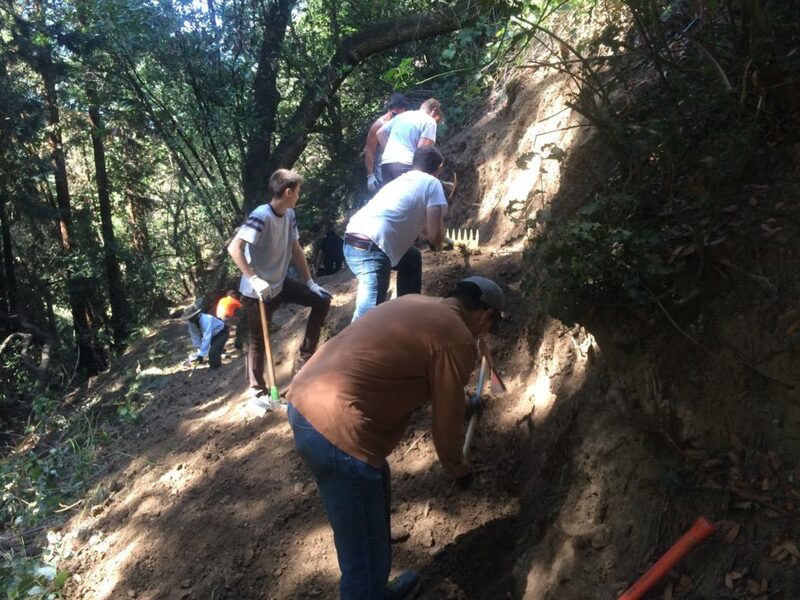 Oakland Trails then began raising the funds needed for the project. 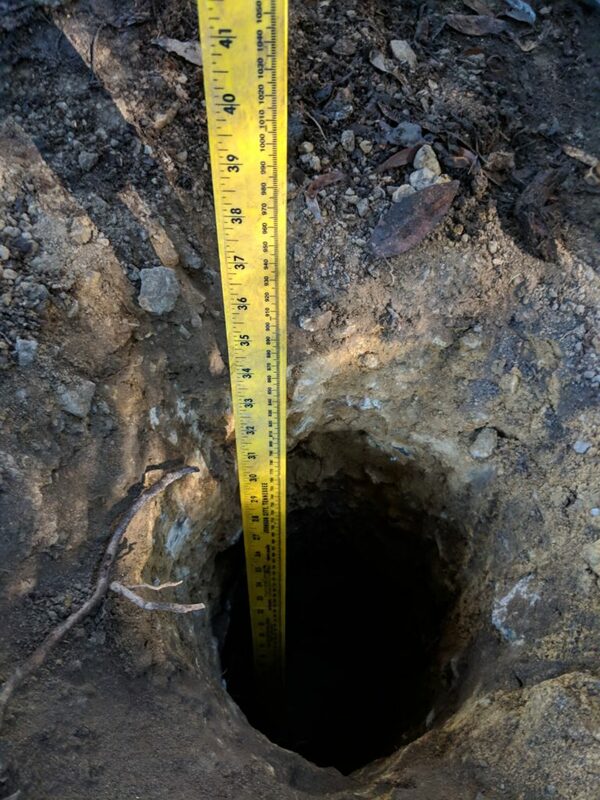 Mid April: OPW agreed to provide staff to help drill the post holes using heavy equipment. May 25th was set as the work date. 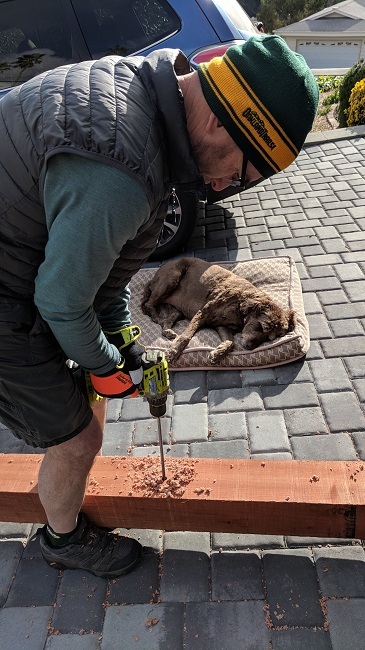 Early May: The materials needed – split rail fencing, gravel, and screws – to match the existing fence were custom ordered at Ashby Lumber. The total project bill, including their generous discount for our non-profit organization, was $1200. 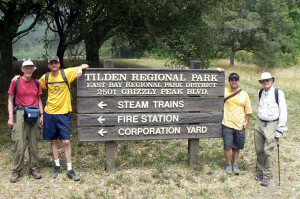 May 23: The materials were picked up by Oakland Trails volunteers and hand-delivered to the site. 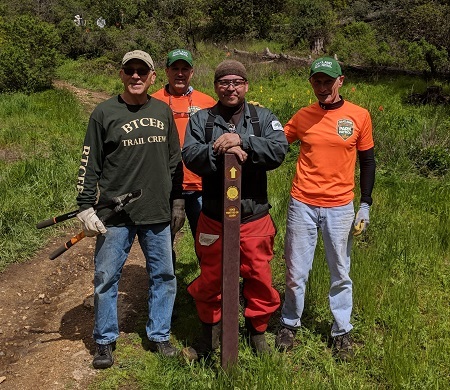 May 24: Oakland Trails volunteers prepped the materials and the work site. 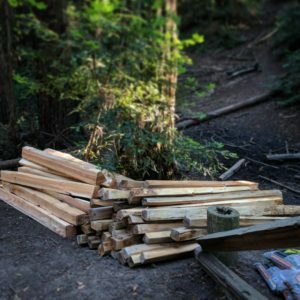 May 25: Construction began at 8:30am. 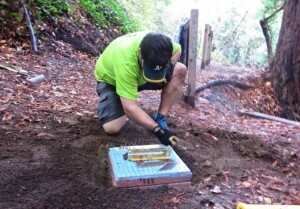 OPW’s Michael Allen drilled the post holes while Oakland Trails volunteers installed the posts and rails. 140 ft of new fence was installed by lunch! What a crew!! 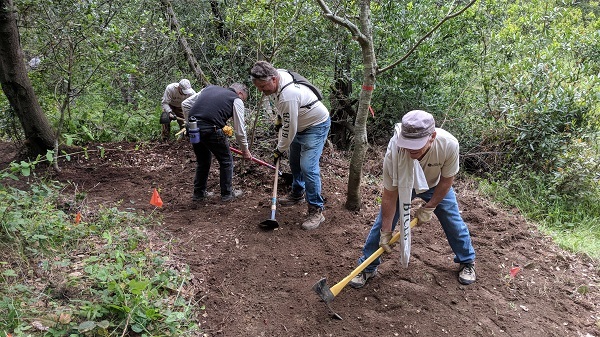 We’d like to thank the following sponsors for their support of this project and our volunteers: Ashby Lumber, La Farine Bakery, Farmer Joe’s Marketplace. Special thanks also to Oakland Public Works, Friends of Sausal Creek, and Dee Rosario. 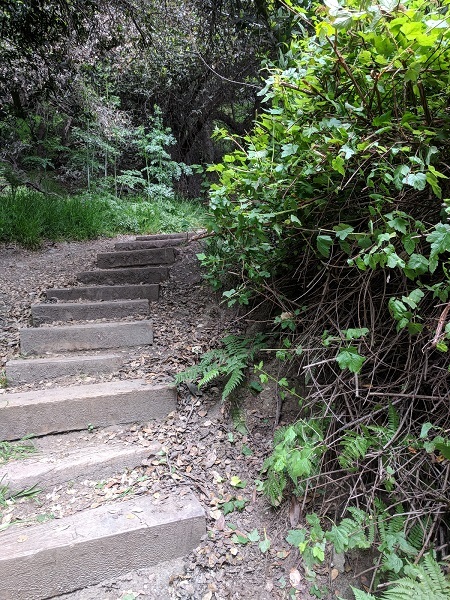 Oakland Public Works and the Oakland Parks & Recreation Advisory Commission have approved our plan to replace and add almost 30 new steps in Joaquin Miller Park. 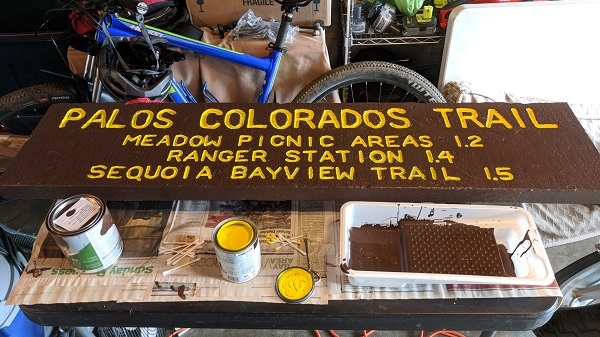 This work will be performed on lower Palos Colorados and Fern Ravine Trails, both hiking-only trails. 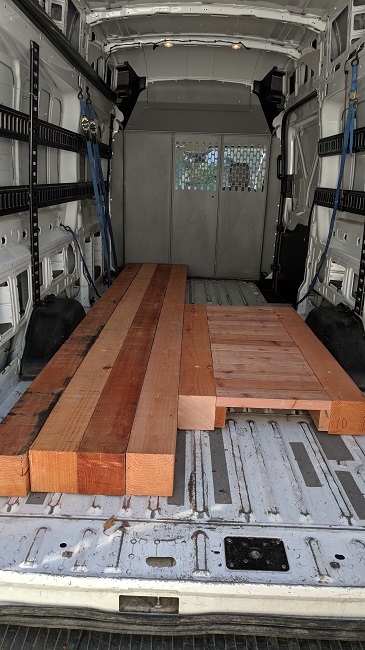 To protect the watershed, we will not be installing wood treated with chemicals – only pure, ethically harvested redwood timbers will be used for this project. 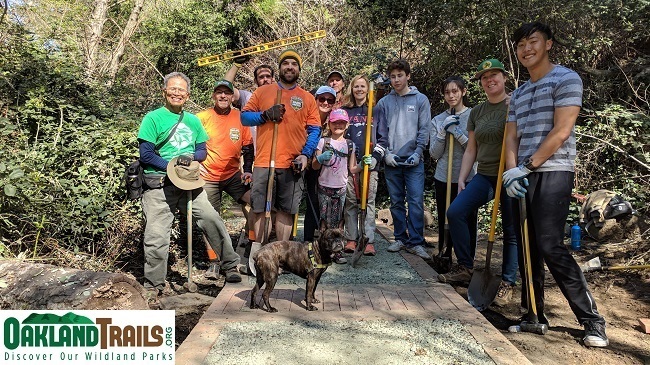 Please click on the donate button to fund one or more steps with a tax deductible contribution (all funds are processed through our 501c3 fiscal sponsor, the Oakland Parks & Recreation Foundation). Oakland Trails led the effort to install new trail markers in Dimond Canyon Park. 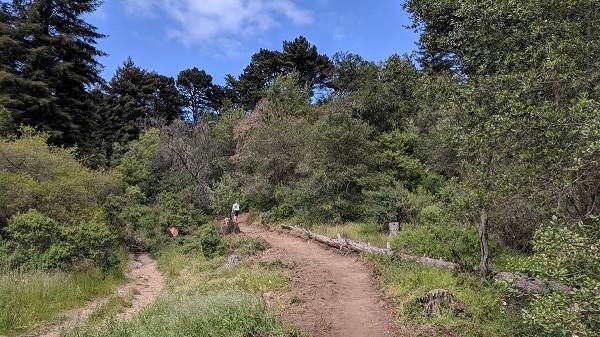 This City of Oakland open space spans 90+ acres, connecting the Dimond, Glenview, Oakmore, Montclair, and Piedmont Pines neighborhoods. 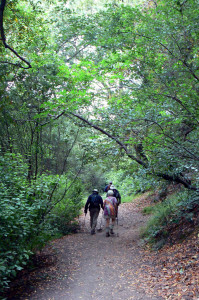 In the heart of the Sausal Creek watershed, it is lush with a mixed forest of oaks, buckeyes, willows, bay laurels, and redwoods. 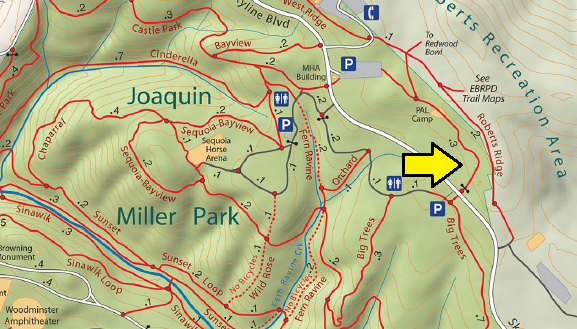 The trail system runs the length of the open space, between El Centro Ave and Monterey Blvd. 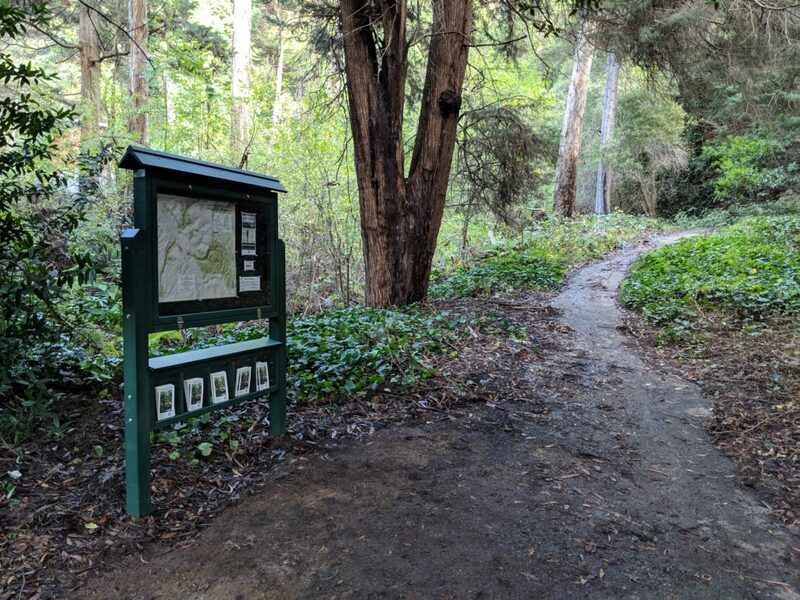 Sandwiched between Dimond Park and Joaquin Miller Park, it forms part of the celebrated link connecting Dimond Park to the Bay Area Ridge Trail. 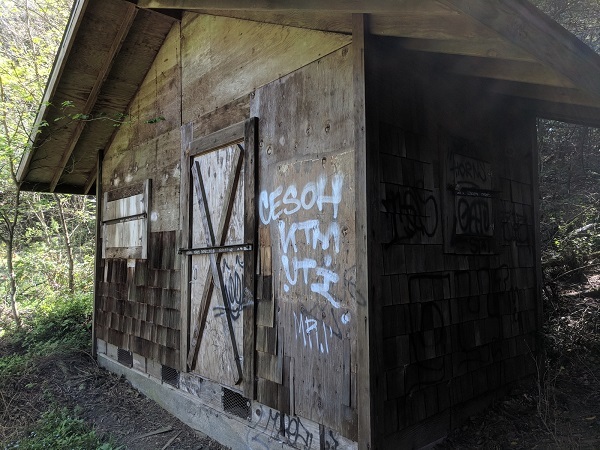 Unfortunately, graffiti can be a problem in this otherwise beautiful park, and the few existing trail markers (now removed) were badly vandalized. Repurposing an idea implemented to curb graffiti on litter containers , we designed the concept, then engaged Whitney Smith Pottery for the name plates, and local artist Roberto Costa to produce and install the finished mosaic tiles. 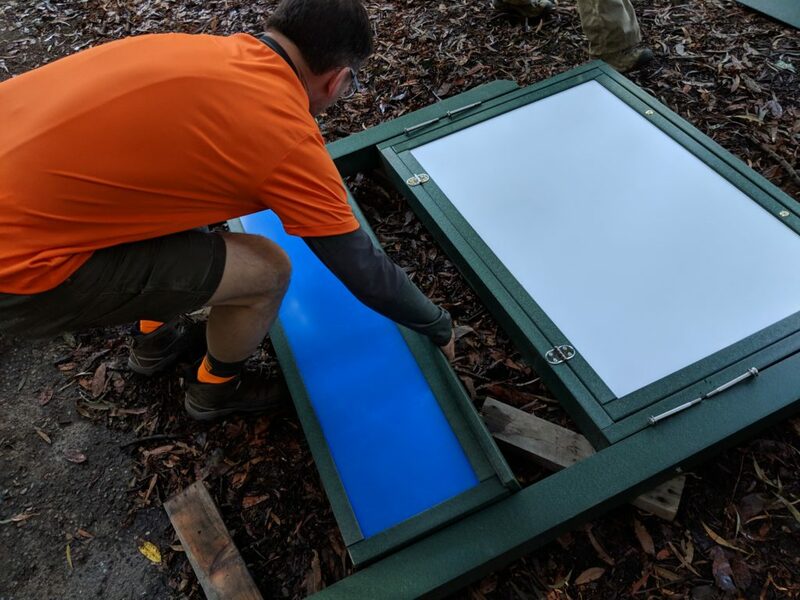 The budget for this project was $3,000. 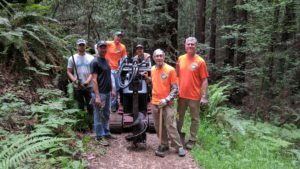 To continue our work in this trail system, your tax deductible contributions, large or small, are greatly appreciated. DONATE. a 501c3 nonprofit corporation. Donations are tax deductible. 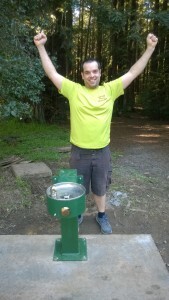 The leaky drinking fountain that was capped off and removed from the top of Big Trees Trail in Joaquin Miller Park has been replaced! 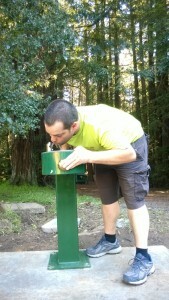 What started out as a Public Works service request by the Friends of Joaquin Miller Park is now a newly installed, ADA-compliant drinking fountain at Redwood Glen, a much used area of the park. We’ll feature another successful collaboration in the film. Stay tuned!